Synthetic peptide within Human FGF21 aa 1-100. The exact sequence is proprietary. Recombinant human FGF21 + IgG1 fusion protein (Fc Chimera Active) (ab108556) can be used as a positive control in WB. Human fetal liver lysate, HeLa cell lysate, A549 cell lysate, Human lipoma tissue, Human thyroid carcinoma tissue. Shipped at 4°C. Store at +4°C short term (1-2 weeks). Allow to warm to room temp and agitate gently before aliquotting. Store at -20°C long term. Avoid freeze / thaw cycle. Our Abpromise guarantee covers the use of ab171941 in the following tested applications. WB 1/1000. Predicted molecular weight: 22 kDa. Immunohistochemical staining of paraffin embedded human stomach with purified ab171941 at a working dilution of 1/250. 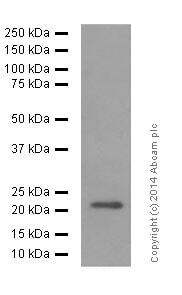 The secondary antibody used is ab97051, a HRP-conjugated goat anti-rabbit IgG (H+L), at a dilution of 1/500. The sample is counter-stained with hematoxylin. Antigen retrieval was perfomed using Tris-EDTA buffer, pH 9.0. PBS was used instead of the primary antibody as the negative control, and is shown in the inset. Immunohistochemical analysis of paraffin embedded Human lipoma tissue labeling FGF21 with unpurified ab171941 at 1/100 . Immunohistochemical analysis of paraffin embedded Human thyroid carcinoma tissue labeling FGF21 with unpurified ab171941 at 1/100 . Publishing research using ab171941? Please let us know so that we can cite the reference in this datasheet. There are currently no Customer reviews or Questions for ab171941.